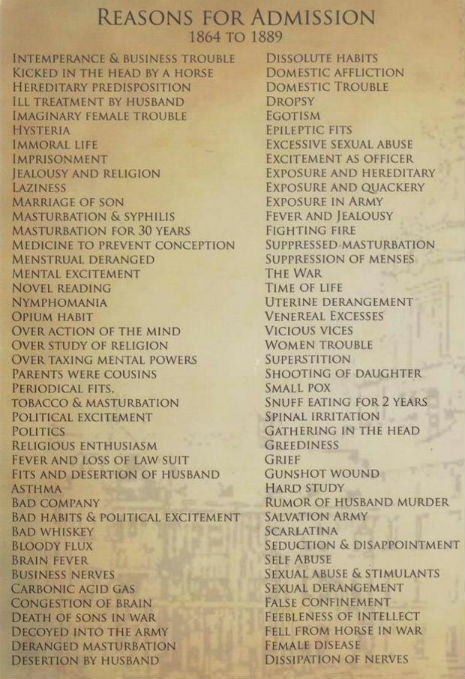 This image has been passed the internet for quite some time now and shows the 'reasons of admission' to insane asylums between the years of 1864 and 1889. The first time I saw a version of this was in the appendix of A Short History of Weston Hospital: Weston, WV by Joy Gilchrist-Stalnaker (2007). And as many readers will immediately recognize---Weston State Hospital was formerly operated as the Trans-Allegheny Lunatic Asylum, a name that the current owners have re-bestowed upon the now-closed mental health facility in central West Virginia. A similar list can also be found in the more recently published, Lunatic: The Rise and Fall of an American Asylum by Edward S. Gleason and both books contain lists with even more reasons for admission not included in this particular infographic. Further, according to the website, Appalachian History, a published list of rather strange reasons to be admitted to the Trans-Allegheny Lunatic Asylum appeared in an even earlier publication---a pamphlet from 1993 written by Marjorie E. Carr, which states that these reasons were pulled from the early log books of the Trans-Allegheny Lunatic Asylum between October 22, 1864 and December 12, 1889. So, its pretty well established WHERE these strange reasons came from...but were people REALLY admitted to an insane asylum for things like being lazy and reading too many novels? Yes and no. Indicating that greediness and bad company were enough for one to be deemed insane, and thus admitted to the Trans-Allegheny Lunatic Asylum and similar facilities is a little misleading unless you understand the state of psychiatric care in the late 1800s. The book, Broadmoor Revealed: Victorian Crime and the Lunatic Asylum, by Mark Stevens offers one of the most simplistic explanations for the rather disturbing nature of the list above. Throughout the 1800s, most doctors focused less on a 'diagnosis' as we'd understand it today, and instead, would ascribe a "cause of insanity" to each patient. These causes of insanity usually fell into one of two categories: 1. Moral Circumstances, which would include things like intemperance and vice; religious excitement; being unlucky in love; anxiety; and poverty. 2. Physical Conditions, which would include fever, head injuries and childbirth. So, just because you read too many novels in and of itself wasn't necessarily a ticket to the asylum; you actually did have to 'act crazy.' But, you weren't 'crazy' because of schizophrenia, depression, or anything else found in the DSM-IV...you were crazy because you read too much! There had to be a reason for your insanity, and eh, reading too much was out of the norm for the time period, so that must have been the cause. Up until fairly recently, there wasn't a great deal of treatment options available in mental health and what was available was administered whether the patient suffered from schizophrenia, dementia, dissociative identity disorder, etc. And in a time where mental illness wasn't really understood, I guess it just seemed to make more sense to classify and group patients based on what triggered/caused their 'insanity.' So don't worry! Your son can get married, your husband can desert you, you can lose a lawsuit, or you can be imprisoned and it doesn't necessarily mean you're automatically eligible for a room with padded walls. But...if you were a woman during this time period and your family or spouse wanted you out of the way, it was pretty darn easy under this system to have you put away for a long, long time.